The ultimate teambuilding event is a 'Souped up' one! Our events offer fantastic kitchen camaraderie, significant volunteer happiness and hands-on togetherness! Engage your company/group in an event that will build community within your organization while in-turn benefitting women, children and youth in crisis. Like our standard Soup Sisters and Broth Brothers events your group will come together under the guidance of a Chef Facilitator, to participate hands-on in preparing hundreds of litres of nutritious soup that will be delivered fresh to a local Shelter. 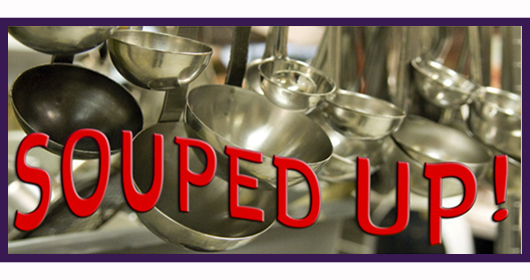 'Souped-Up' provides you the opportunity to reserve a date that works for your organization and Soup Sisters will work with our culinary partners to make it happen. The evening (or afternoon) will commence with wine, appetizers, and welcome from Soup Sisters. In keeping with our mandate of awareness and education a guest-speaker will also address your group regarding the issues surrounding family violence or youth homelessness. Once the soups are simmering, participants will be offered a simple and delicious meal of soup, salad, fresh bread, and wine to compliment. Provide our Coordinators with 2-possible dates & times that work for your organization, daytime or nighttime, your choice! Soup Sisters will then contact our culinary partners and begin organizing the event in its entirety. The registration fee of $95.00 per person is payable via cheque, or PayPal & a Charitable Tax Receipt for $40 per person will be provided.